The North Vancouver Recreation & Culture Commission was established in 1971 as a partnership between the City of North Vancouver and the District of North Vancouver and we are proud to have served one of Canada's most active and healthy communities for more than 45 years. Our mission is to build healthy individuals, families and communities and we know that recreation and culture are vital to the overall health, wellness and creativity of our community. That's why we provide and facilitate quality municipal recreation and culture programs, services and events that enhance the quality of life for all North Vancouver residents. 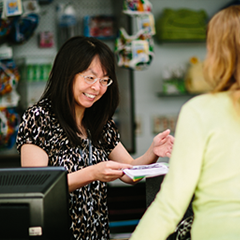 We operate 10 Community Recreation Centres, the North Vancouver Tennis Centre and the North Shore’s largest performing arts theatre - Centennial Theatre. We also manage room and venue bookings for facilities, fields, and outdoor spaces across North Vancouver. We promote creativity, celebrate diversity and contribute to North Vancouver’s unique sense of place through the provision of cultural services that include: a comprehensive Arts & Culture Grants program; cultural planning resources; and a public art program. Connect with us by participating in recreation and culture activities, visiting our facilities, sharing your talents as a volunteer, or exploring our employment opportunities. Contact us with your questions and ideas. The North Vancouver Recreation & Culture Commission is an entity of the City and District of North Vancouver; created to fulfill the municipalities' responsibilities for arts and recreation. These responsibilities include the provision of quality recreation and arts experiences, operation of community recreation facilities, capacity building of relevant arts and recreation organizations, management of the public art programs and oversight of the community arts grants. Recreation and arts are vital to North Vancouver becoming the most vibrant, diverse, active, creative and connected community. The North Vancouver Recreation and Culture Commission improves the health and well-being of all North Vancouver individuals, families and communities and inspires residents through quality recreation and arts opportunities. Recognizing that we are integral to the health and wellness solution, the NVRC will work with other service providers to proactively and intentionally respond to indoor and outdoor recreation and arts needs, with a focus on those who would benefit most, including youth, those who are under-served, and those with barriers to accessing quality recreation and arts opportunities. We act with integrity, ensuring open, respectful relationships and supportive environments. In 2013, North Vancouver Recreation & Culture Commission (NVRC) commissioners and staff developed the 2014-2018 Strategic Plan which includes the NVRC’s mandate, vision, mission, values, strategic directions and goals for the five year period. Read the Strategic Plan. In 2006, the North Vancouver Recreation & Culture Commission (NVRC) conducted a North Vancouver-wide recreation needs assessment and developed a long-term recreation facility plan. Read the Recreation Needs Assessment Executive Summary and the Recreation Facility Plan.